It’s strange to be writing this so late, but somehow I neglected to write a post about my time in Ouarzazate and its environs a few months back. The whole area is quite lovely and peaceful. 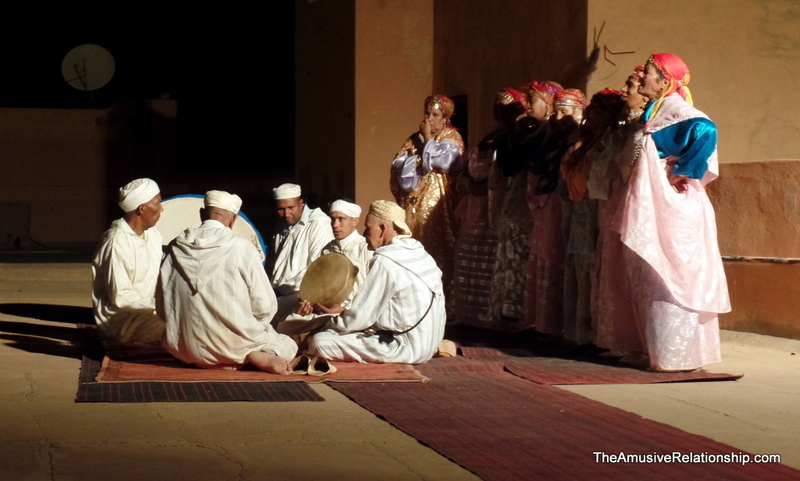 In fact, the word ‘Ouarzazate” means “without noise” or “peaceful” in the native Tamazight language. Known also as the Moroccan Hollywood, it has several production studios in town where dozens of movies and television shows, mostly American ones, have been filmed, including Game of Thrones, Troy, Kundun, and many others. I also visited Ait Ben Haddou and, besides being featured in many movies as well, including Indiana Jones and Gladiator, is also a UNESCO World Heritage Site, but that will be an upcoming post. Peace Corps held a training in Ouarzazate to help volunteers stationed in the southern regions improve their understanding of the indigenous language of Morocco spoken by the various branches of Amazigh peoples. Though they are often called Berbers (Barbarians), a name given to most non-Romans by Romans indicating their inability to understand local languages—they heard “ba, ba, ba,” similar to English’s “blah, blah, blah”—it’s actually a pejorative term stemming from Roman colonization of North Africa. The word for language being feminine, the prefix ‘t(a)-‘ and the suffix ‘-(e)t’ are added to indicate the language used by the people. Thus, the broad term for the language family is Tamazight, though there are regional dialects such as Tasoussit (also known as Souss and spoken in the more southerly regions), Tashilhaet (also known as Shilha and spoken in the middle areas around the Atlas Mountains and southeast), and Tarafit (spoken among the people of the Rif Mountains in the north. Note, much like Arabic or other alphabets, Latinized spelling varies due to transliteration, so it might be spelled differently in different contexts. As a matter of practice, much of the written language uses Arabic script since for centuries, except during the French colonial period, that has been the official language of the area. However, there has been a resurgent pride in recent years in Amazigh identity which led to official recognition of the language and a push toward using its more traditional lettering. It is now seen alongside Arabic on all official signs and many others. 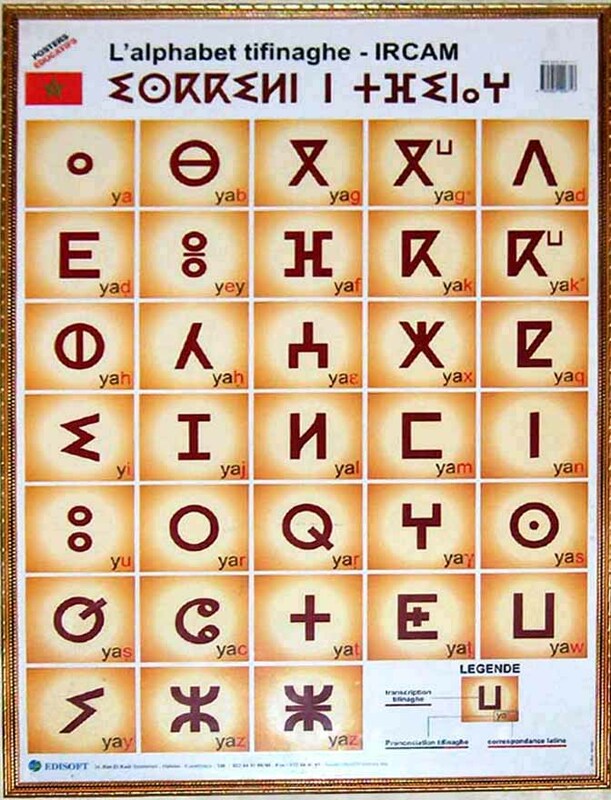 The Tamazight alphabit, called Tifinagh, is thought to be a mix of indigenous North African inscriptions mixed with existing Phoenician/Punic systems. The image on the left shows the alphabet as well as its usage in the title. Ourazazate is much like other cities in the southern desert areas. Its buildings are painted the same shade of sandy pink, outside of town is dry open land, and in the older areas, one can still see the traditional building construction that makes use of mud and hay. Because of that, perhaps, is what makes it unique. While much of the city is fairly modern with several studios turning out multi-million dollar movies (see the gallery below), there are large areas that still hold to more traditional modes of living. To the right, is an image of the central plaza. During summer evenings, it becomes a thriving space full of people. Nearby is the local souq (open market), so hundreds of people mill about and catch up on the day’s events. Cafés and restaurants surround the square, ensuring ample opportunity for people watching, a favorite Moroccan pastime. 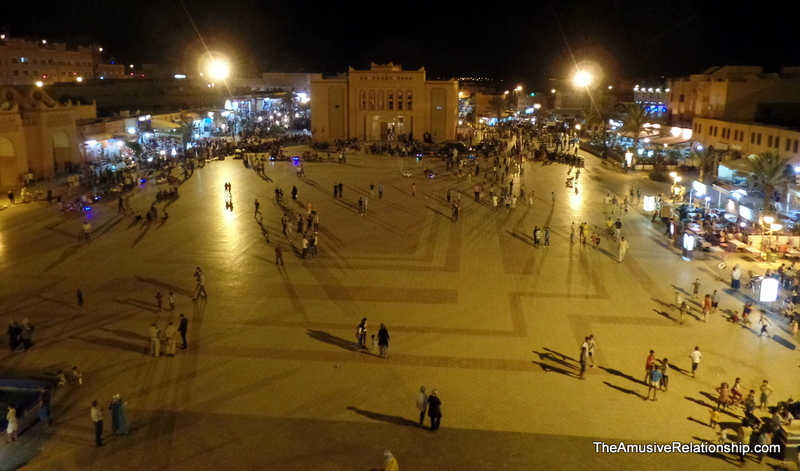 Certainly, the biggest draw to Ouarzazate for most people are the film studios. There are several, but I toured only one. A group of us spent an afternoon off from training walking through Studios Atlas, northwest of town center. Aside from an impatient and sometimes rude tour guide, it was fun to walk through past movie sets and imagine them being filmed. On the flip side, it was equally intriguing to walk behind the walls and see how truly fake it all is. What looks on film like genuine ancient Egypt, was merely rubber, wood, and plaster. Below are some images of our walk through the studio. Keep scrolling for details and images of the kasbahs or click here to jump ahead past the image gallery. Just outside of city center is an older ksar/douar (community) surrounding Kasbah Taourirt (not to be confused with a city of the same name in the north of Morocco). It is across the street from the city’s museum of cinema. Unlike other Glaoui kasbahs, Taourirt escaped ruin by moonlighting as a Hollywood backdrop (Sheltering Sky, Gladiator, Prince of Persia ) and attracting the attention of UNESCO, which has carefully restored small sections of the inner sanctum. Follow the maze of stairwells to the top floor, where you’ll find a prayer room through keyhole archways, traces of stucco and an original tataoui ceiling. Wander through the village inside the kasbah walls, and you might also find deals on local crafts in backstreet shops. A bit further from town lies another, larger Glaoui kasbah that has been restored. Tifoultoute, which strangely enough is also the Amazigh word for the tangled hair left behind in a brush, is a grand manor house with expansive views of the surrounding countryside. It is furnished much as it was during its use, so it’s easy to imagine Glaoui and his cronies sitting around plotting the overthrow of Sultan Mohammed V.
A quick word on the “Pasha of Marrakech.” Part of an indigenous tribe from the High Atlas Mountains, Thami El Glaoui, in coordination with the French, helped to overthrow the existing Moroccan royalty. He was rewarded with a position as feudal lord, Pasha, over most of southern Morocco. His reign was both cruel and very profitable, helping him to become one of the wealthier men in the world at the time. During his time in power, he constructed many kasbahs throughout his dominion, many of which are now in disrepair. Tifoultoute and Taourirt are just two of many. 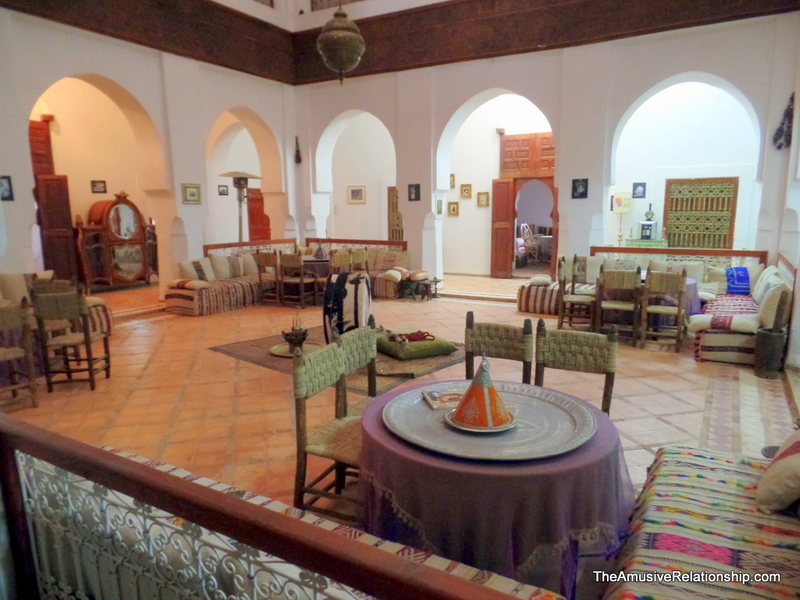 Some images of Ourzazate, Kasbah Taourirt, and Kasbah Tifoultoute. Keep scrolling for Ait Ben Haddou and Studio Atlas.